After several years of meteoric growth, business groups are boasting about setbacks in the movement for higher wages. 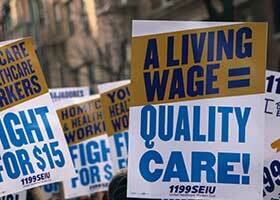 But closer examination shows momentum remains strong for improving pay for the 40 percent of U.S. workers who struggle on less than $15 an hour. 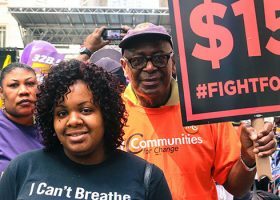 Fast food workers launched the Fight for $15 in 2012, and by early last year, cities and states representing 18 percent of the U.S. workforce had approved $15 minimum wages. Once phased in, these measures will deliver raises of around $4,000 a year for more than one third of the workforce in states like New York and California, beginning to reverse decades of growing income inequality. 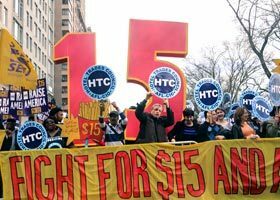 In November, voters in four more states and one city approved minimum wage increases of $12 to $15 an hour, with the result that about one quarter of the nation will soon be covered by high minimum wages. Push back was inevitable. It started with New Jersey Governor Chris Christie vetoing a $15 minimum wage passed by the legislature. Then in Flagstaff, Arizona after voters approved the first $15 wage in the southwest, business groups filed a counter-initiative seeking to roll it back. Last week Baltimore Mayor Catherine Pugh vetoed a $15 minimum wage increase. And now in Missouri, after the state supreme court struck down the Tea Party legislature’s attempt to block wage increases in St. Louis and Kansas City, the legislature is threatening to try a new ban. 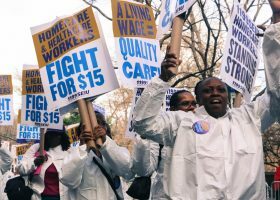 But despite these speed bumps, closer scrutiny shows that the movement to raise pay is, if anything, spreading to more states. In New Jersey, where Governor Christie is term-limited, the leading candidates to succeed him back the $15 minimum wage, making passage in 2018 likely. In Flagstaff, the city council rejected attempts to schedule an early election on the initiative to cut the wage and, while tweaking the law to smooth its phase-in, actually raised the city’s minimum wage even higher to $15.50. In Maryland, where Mayor Pugh has urged action at the state level instead, Democrats have introduced a statewide $15 minimum wage bill. And in Missouri, if the legislature passes a new ban on local raises, advocates have already filed paperwork to put a statewide wage increase on the 2018 ballot where it is all but certain to pass. Other major states appear poised to follow. Leaders in the Illinois legislature are holding hearings on a $15 minimum wage, which could be headed to Governor Bruce Rauner’s desk soon. And leaders in Vermont, Massachusetts, Connecticut, Rhode Island, Hawaii and Minneapolis are all pushing similar $15 legislation. And what’s been the impact on jobs as states and cities have phased in higher wages? In December the White House Council of Economic Advisors compared employment data for all of the states that raised the minimum wage since the 2009 recession with those that didn’t. 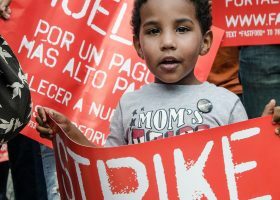 They found “substantial wage increases with no discernible impact on employment levels or hours worked.” That’s in line with the lion’s share of recent rigorous research on the minimum wage. Nonetheless, restaurant industry groups continue to cite claims by individual businesses that higher wages are forcing them to close. Sorting fact from fiction here isn’t easy. But what is clear is that overall job growth data don’t back them up. Instead, strong job expansion has continued in places like San Jose, New York City, Seattle and Chicagothat have adopted some of the nation’s highest minimum wages. 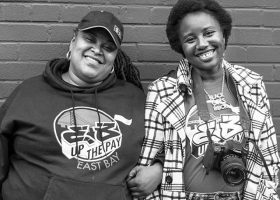 State-of-the-art studies on the $15 minimum wages proposals in California, New York and Minneapolis help explain why. They find that though a $15 wage increases costs for businesses, it also generates billions in new consumer spending that offset much of the higher cost. 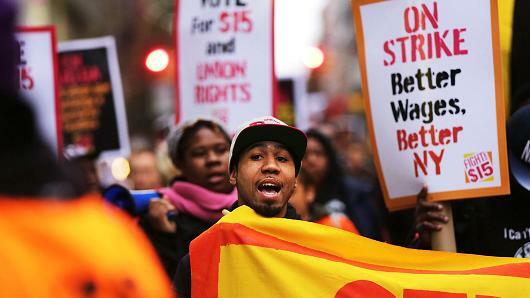 In states that have already approved $15 minimum wages, business organizations representing more than 32,000 small businesses have either endorsed — or in some cases simply not opposed — the $15 minimum wage. These include the Greater New York Chamber of Commerce, the Brooklyn Chamber of Commerce, the Restaurant Association of Metropolitan Washington, the Golden Gate Restaurant Association, the Northeast Organic Farmers Association – New York Chapter, and the Long Island and Westchester/Putnam African-American Chambers of Commerce, and others. What lies ahead? Two strong Fight for $15 supporters, Tom Perez and Keith Ellison, now lead the Democratic National Committee. And more and more Democrats in Congress are talking about coming together around making $15 the next federal minimum wage bill. But with the Republican Congress and the Trump Administration focused not on raising pay but on rolling back protections for workers, no one is betting on federal action. That means the gulf between the cities and states where pay is beginning to rise, and those where even manufacturing workers and EMT’s struggle on less than $15 an hour, will only grow as the nation heads into the 2018 election. That’s when voters will get to decide what they think of politicians who side with corporate lobbyists rather than working families fighting for a decent paycheck. This column was originally published by CNBC.